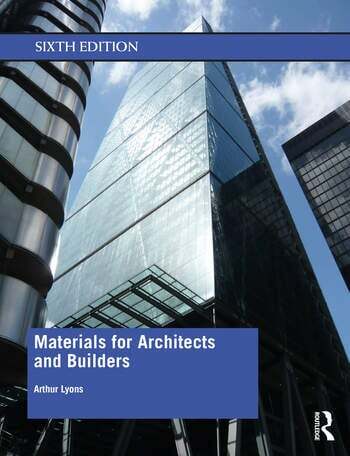 Materials for Architects and Builders provides a clear and concise introduction to the broad range of materials used within the construction industry and covers the essential details of their manufacture, key physical properties, specification and uses. Understanding the basics of materials is a crucial part of undergraduate and diploma construction or architecture-related courses, and this established textbook helps the reader to do just that with the help of colour photographs and clear diagrams throughout. This new 6th edition has been completely revised and updated to include the latest developments in materials research, new images, appropriate technologies and relevant legislation. The ecological effects of building construction and lifetime use remain an important focus, and this new edition includes a wide range of energy saving building components. Arthur Lyons was formerly Head of Quality, principal lecturer and teacher fellow for building materials in the Leicester School of Architecture, Faculty of Arts, Design & Humanities, De Montfort University, UK. He was a lecturer in building materials within schools of architecture and surveying for thirty five years, and is now an established writer on construction materials.